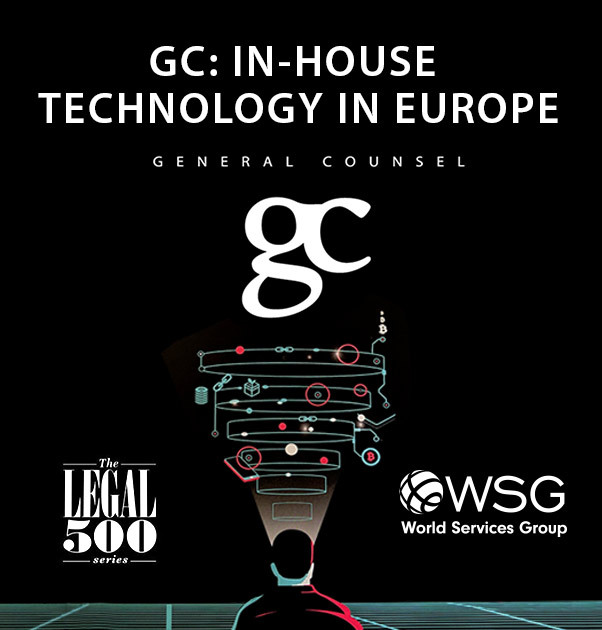 WSG in partnership with The Legal 500's GC Magazine, recently published new survey results that provide insight on trending technologies in the legal sector and how European general counsel members are adapting to the changes. To access the full special edition, visit GC Magazine's site here. When asked whether technology had the potential to disrupt the legal profession over the next five years, 84 percent said they believed that technology will be disruptive. Of those, 66 percent felt that it would be somewhat positive, 29 percent thought that the disruption would be entirely positive, and 6 percent thought that the disruption would be negative. Regarding current use of technology within their legal departments, 84 percent reported that they use some form of specialized legal technology within their legal department, with 82 percent revealing that their department's use of technology had increased in the past five years. Of those who indicated that they were using specialist legal technology within their departments, increased efficiency was the most frequently cited factor that general counsel were considering when implementing new technology. That was followed by ease of use at 50 percent, customizability at 32 percent and the ability to integrate with existing systems at 31 percent. Fifty-five percent of respondents listed contract management as the most commonly cited use of technology. Software for law firm relationship management and increasing transparency around legal spend, including e-billing, was also of interest. Twenty percent of respondents cited that their use of technology included law firm relationship management, and according to the interviews complementing the quantitative research, this is an area that appears to be prime for expansion in the short term. Forty percent cited that legal case management was another popular focus and it was one of their uses for technology. This can include the basic paperwork, inducing case management tasks, but can also include case review administration and analytics. Much of the current conversation around AI is about its potential. Only 9 percent anticipate AI disrupting the legal industry within the next two years. Fifty-nine percent expect AI to be a disruptor within the next five to 10 years, and the remaining 32 percent believe it would not be a disruptor within the next decade. Only 8.8 percent of survey respondents reported using AI solutions currently. The clear frontrunner in terms of AI-generated excitement among the corporate legal departments who participated in the research for this report was information management, which can be assisted particularly by developments such as smart contracting tools. Results showed that buy-in from the business and the necessary budget to execute was a clear hurdle for many. Seventy percent felt their company was supportive of implementing new technologies, but only 56 percent had seen this translate to a bigger budget allocation on their balance sheets. Teams with smaller headcounts had the worst rate of uptake of technology, with 42 percent of departments with fewer than 10 people saying they did not use technology at all. They were also less likely to have received an increase in budget for technology over the past five years, with only 47 percent reporting an increase in budget for technology (compared with 57 percent overall). Ninety-one percent of in-house counsel felt that it was important that their external advisers kept abreast of new technologies. If their external providers were implementing technology to deliver their legal solutions (36 percent) as those that answered that they were (40 percent). Just 37 percent felt satisfied with the use of technology by external firms; 25 percent were not satisfied, and 38 percent were unsure. When asked whether the question of technology arises when undertaking a panel review of external advisors, just 35 percent said that it was a factor, while the majority (41 percent) said it wasn't a factor at all.